Nothing is quite as frustrating as a dodgy claim you’ve fallen for yourself. For me, “abortion is only 3% of what Planned Parenthood does” is one of those claims. Granted, it’s possible to add and divide some numbers to get 3%, but this statistic is misleading (and meaningless) for at least three reasons. The 3% figure is unbelievably contrived. It relies on counting every pregnancy test, STD test, contraceptive, and abortion as an equivalent “service” — even if they were all for the same person and at the same visit. One category of service was providing 2.1 million contraceptives to women†, including 302,724 non-prescription barriers — i.e., condoms or spermicides. Abortion was another service, with 327,653 procedures. If abortion wasn’t stigmatized, and if downplaying it wasn’t a politically savvy PR move, no one would pretend a number like this is meaningful. By this reasoning, most of what heart surgery centers do is run blood tests and dispense aspirin. Last year, PP clinics saw 2.7 million individuals and performed 327,653 abortions (about a third of all abortions in the US). That’s about 12% of their customers. It’s not anything like a majority, or even a plurality, but it doesn’t sound quite as trivial as 3%. And if you want to know how significant a service really is for a company, look at the money. PP affiliates get half their sales revenue — income received from customers for services — and a seventh of their total income from abortion. PP doesn’t say how much money it gets from abortion (because, duh), but it’s not hard to work out. According to the Guttmacher Institute, the average cost of a first-trimester surgical abortion is about $480 and a medication abortion costs about $500. Here’s where it gets contentious, but it doesn’t need to if we’re clear on what we’re talking about. Last year, PP affiliates brought in $305.3 million in non-governmental health services revenue: sales revenue for its services from private customers or insurers. (We can assume that virtually all revenue from abortion comes from private sources because most states and the feds block Medicaid for abortion.) This means that abortion accounts for 52% of PP’s private sales revenue. PP affiliates have other sources of income, notably $528 million in government funding and $257 million in private donations. Counting that, abortion sales makes up close to 14% of total income. However, it’s worth noting that abortion may be the only service that actually brings in more money than it costs. Even for a nonprofit, that makes it relatively more important to the organization than, say, free condoms, “sexuality education,” or other programs, because it is self-sustaining. This line of defense is counterproductive for the pro-abortion side. PP says, “Abortion is great and necessary and ethical and shouldn’t be restricted or disparaged or stigmatized — but we really hardly ever do it, you know. Don’t look at us. It’s not that important. It’s nothing. It’s only 3% of what we do!” And legions of well-meaning liberals repeat this number whenever PP is brought up. Of course, it’s not true. However you slice it — 12% of customers, 14% of income, 52% of sales revenue — abortion is a big part of Planned Parenthood. Most people recognize that, and this transparent “3%” shiftiness just gratifies the idea that abortion is illicit. PP brags about “fighting abortion stigma in pop culture,” but their own reports reflects their cynical capitulation to that stigma. 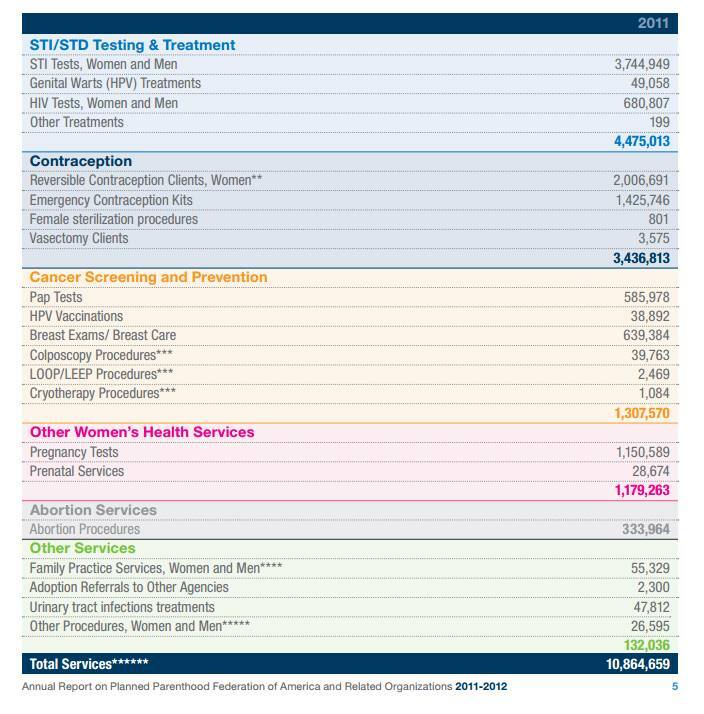 Look at this bright colorful table from one of PP’s reports: can you spot the solitary gray-on-gray line item for abortion? I’m surprised they didn’t shrink it to a tinier font, too. Why not defend abortion as not only important in the abstract, but also as an important part of what PP does? Why launch this full-throated defense of abortion, and then (absurdly) shrink away from the suggestion that it has anything to do with you? Of course, we all know why: Because it’s politics. Because it makes it easier to get and keep government money. I’m not in favor of singling out PP for defunding — that’s probably unconstitutional — and I’m not anti-abortion,* but there’s nothing courageous about misleading the public to get your hands on the tax dollars of people who abhor what you do. This is precisely the problem with politics: It’s zero-sum. There’s no pluralism, no room for people to disagree privately: It’s everyone’s money, but it can only be one group’s preferences. And it makes us worse for participating in it. This transparently silly statistic is just one small proof from an field that is littered with them. † It’s not clear from PP’s report whether this “services” number means that 2.1 million women were given an unspecified number of contraceptives or whether 2.1 million contraceptives were given to an unspecified number of women. * I have no doubt I’ll be accused of being subversive to the abortion cause for not buying into this lousy statistic, but bad arguments are bad on their merits, as well as for the causes they are enlisted in.